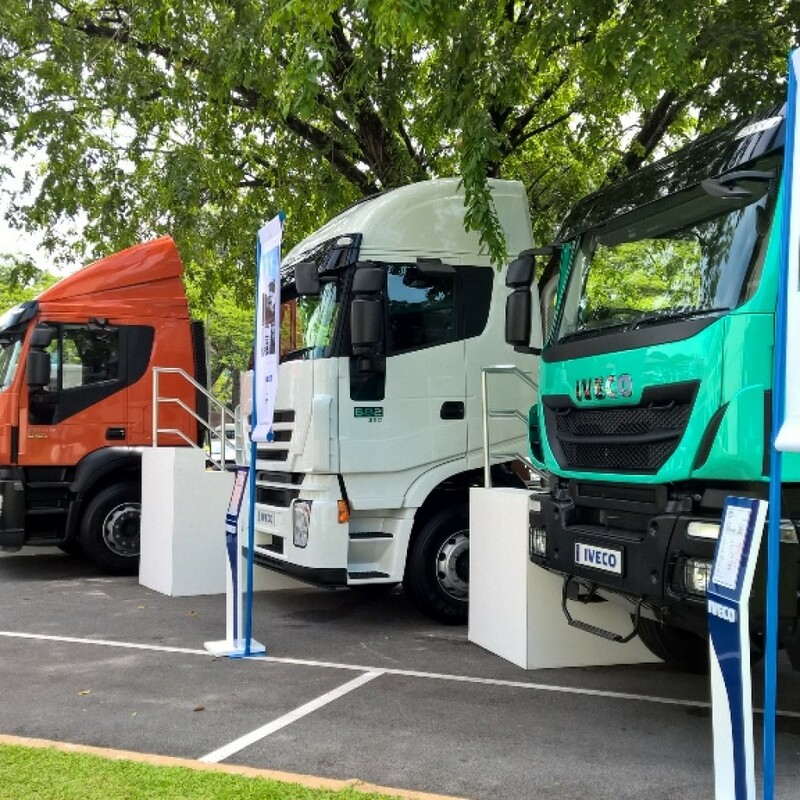 Tata Motors, India’s largest automobile manufacturer, today launched six new next-generation Prima heavy commercial vehicles for the very first time in Kenya with partner Tata Africa Holding Kenya. 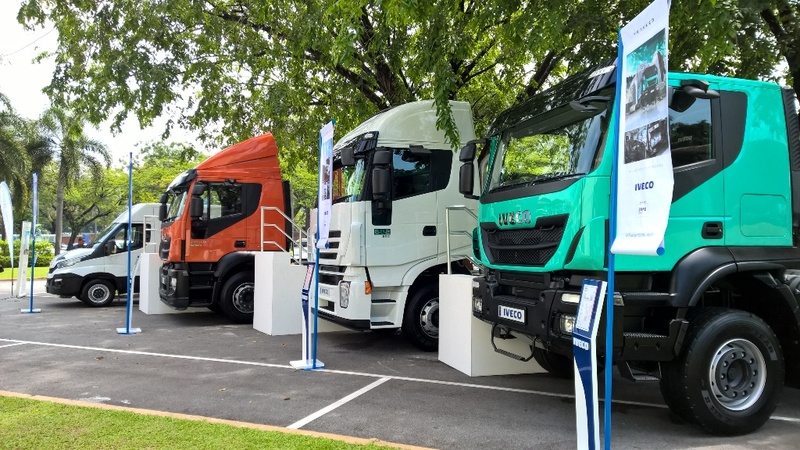 The launch of these new next-generation commercial vehicles marks Tata Motors continued efforts towards changing the trucking landscape and rough roads in Kenya’ and consisting of a series of configurations on the Prima platform. 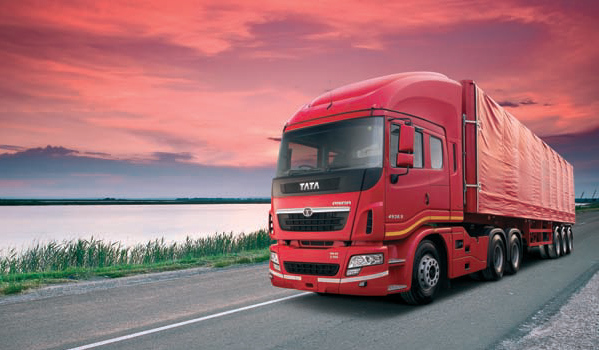 In the Tipper segment, Tata Motors introduced the Prima LX 2523.K, Prima LX 2528.K whereas in the cargo segment, Tata Motors introduced the Prima LX 2523.T, Prima LX 3123.T and the Prima LX 4023.S and the Prima 4938.S, all of which have different combinations of drivelines, meeting end-user requirements for varied applications. Tata Motors recently also launched another initiative for its commercial vehicle business called Tata Genuine Parts (TGP) selling genuine spares in Pilfer proof packaging. 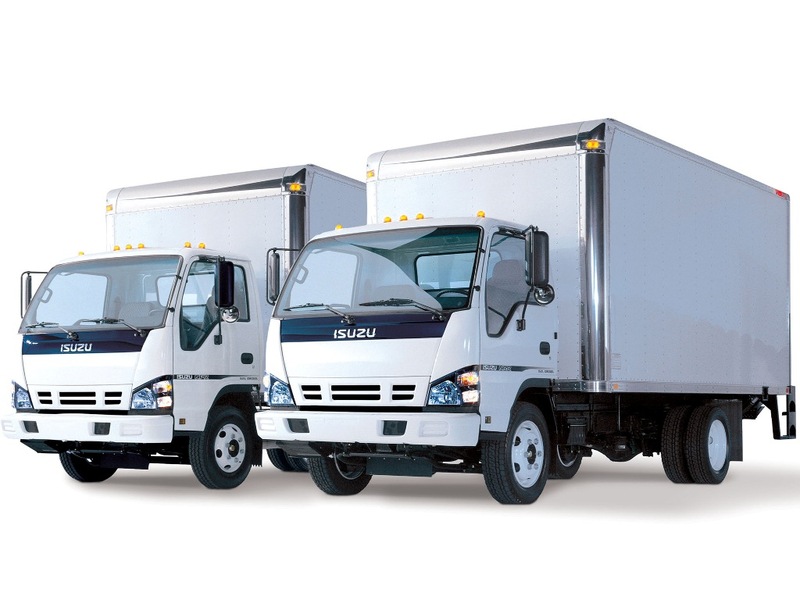 TGP offers long life and reliable performance to owners of single trucks and fleets as its parts are made of superior quality material and conform to OE (Original Equipment) specifications. Not only is every part designed as per exact vehicle specifications, but has to pass multiple quality control checks. Every Tata genuine part is packaged and branded to ensure customers get the right quality part, also enabling them to identity with the package. 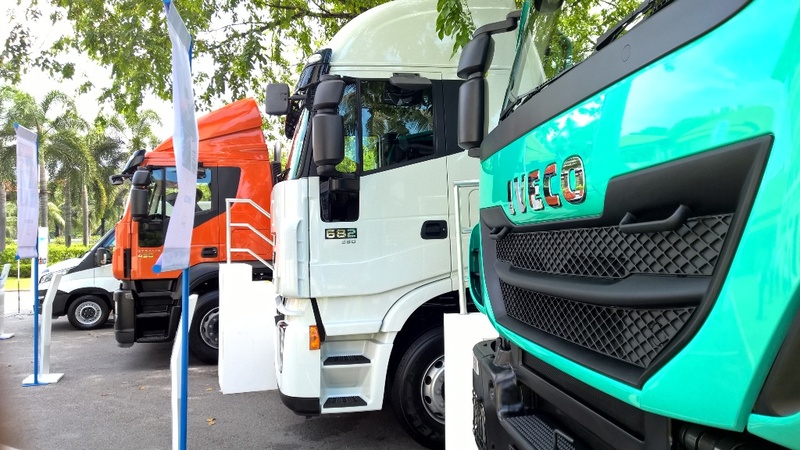 Iveco, a CNH Industrial brand, introduces to the press its full range of commercial vehicles for Malaysia in partnership with Federal Auto Holdings Berhad. 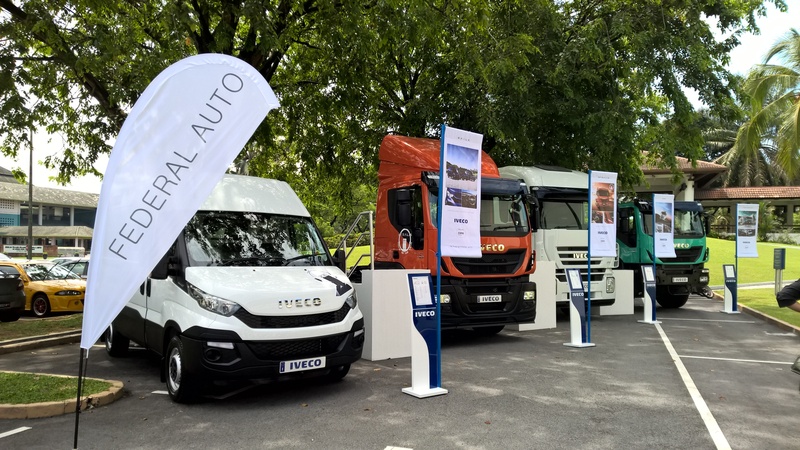 Federal Auto was appointed last year as the exclusive distributor for the sale of Iveco vehicles, service support and the sale of genuine spare parts in the market. 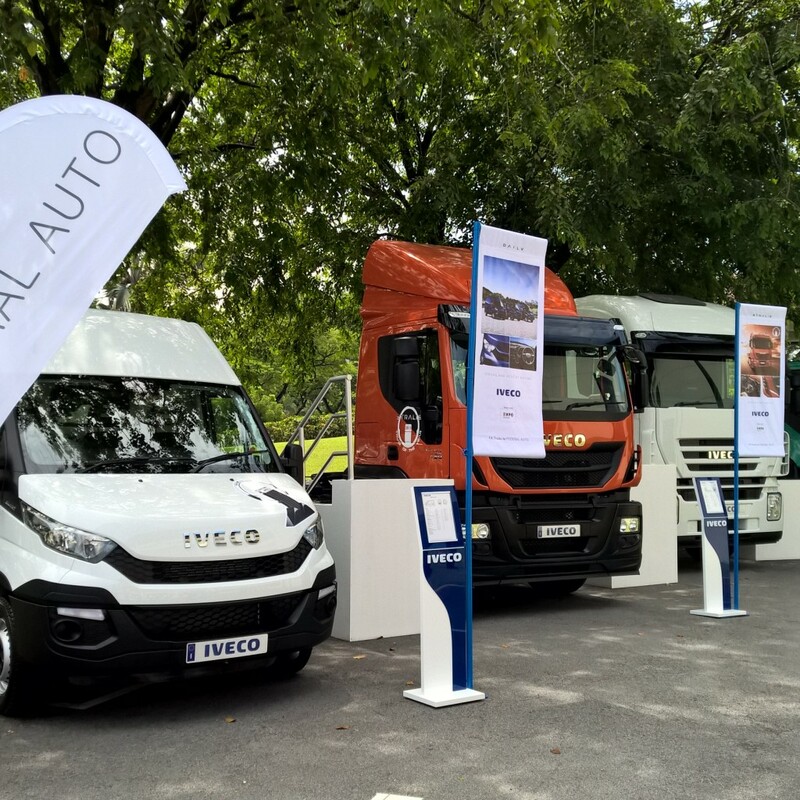 The joint press conference, held today by Iveco and Federal Auto at the Saujana Hotel Resort, in Kuala Lumpur, was the first official event for the brand in the country. 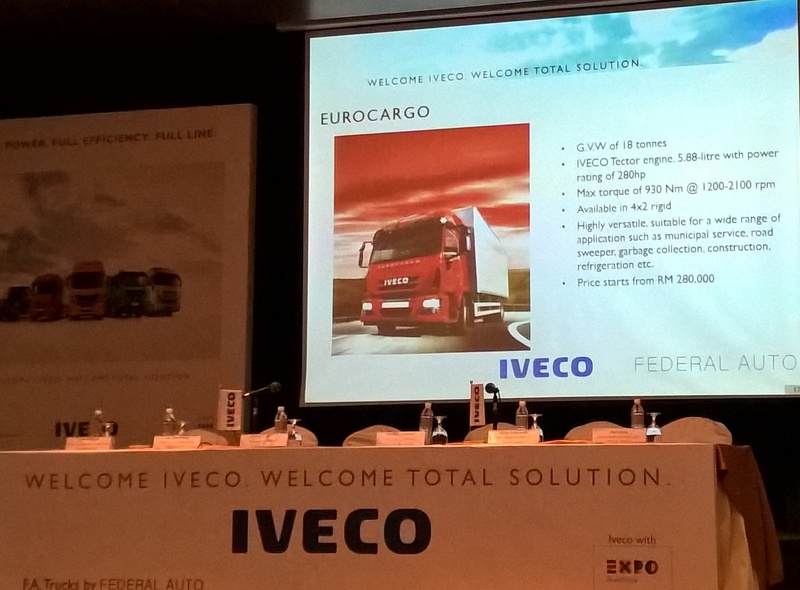 Top Management from Iveco and Federal Auto presented their business strategy for the market, and their plans for the further development of the sales and service network. These include training programmes to ensure customers are supported by professional, skilled staff. 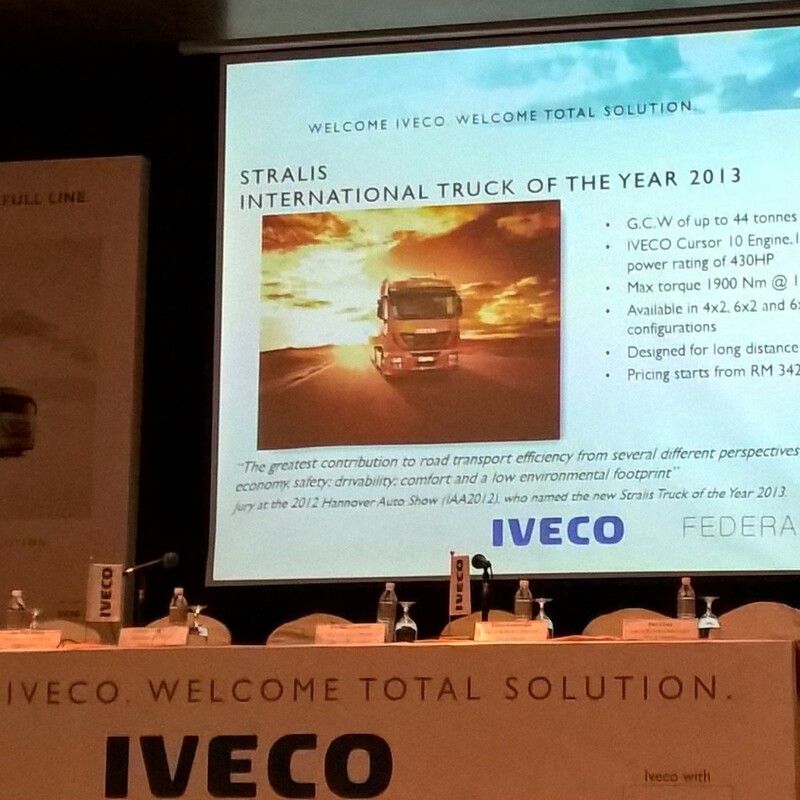 They introduced the wide range of vehicles for Malaysia and presented five key new product ranges in the Iveco line-up: the Daily light commercial vehicle and International Van of the Year 2015, the Trakker off-road truck, the Eurocargo medium truck and, the Stralis Truck of the Year 2013, and the 682 heavy commercial vehicles. 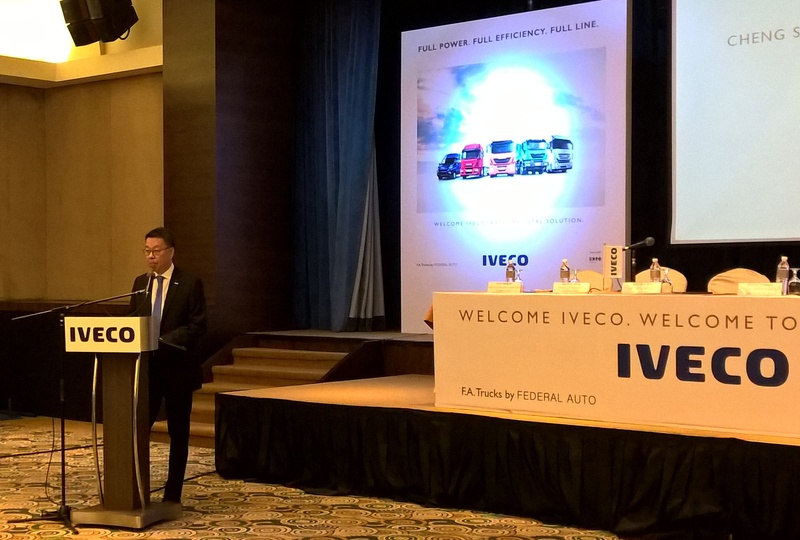 The product offering is complemented with a full range of after-sales and financing which will take advantage of Federal Auto‘s local presence in the country. “I would like to thank the management of Federal Auto for the excellent cooperation that has led to us being here today. 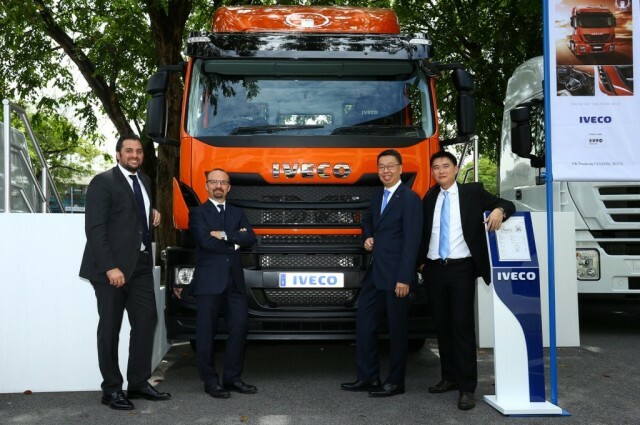 They are a very dedicated, professional team and I am proud that they are representing Iveco trucks and buses as our exclusive distributor in Malaysia. 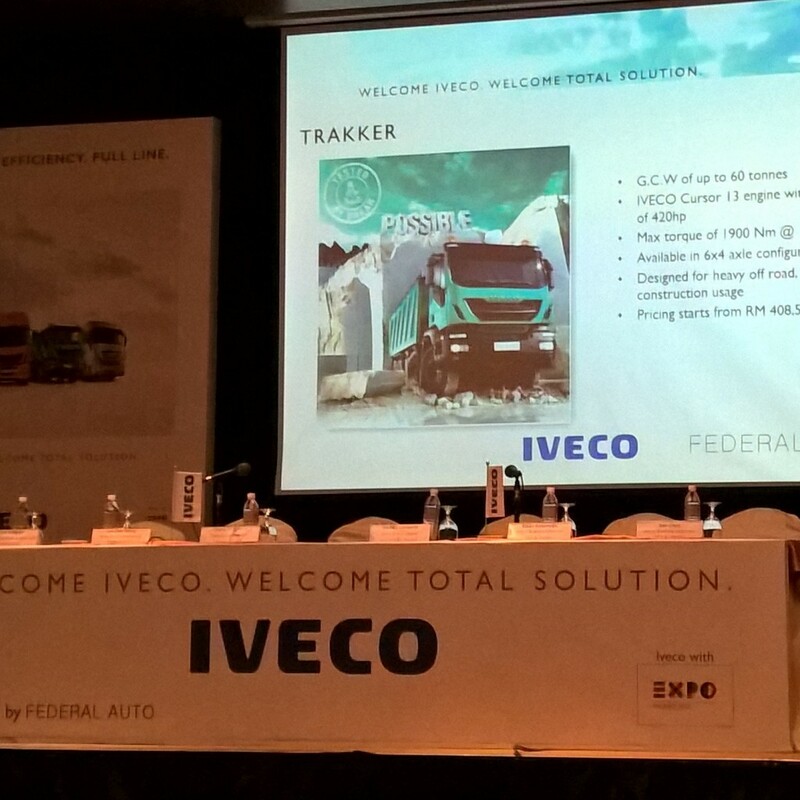 I believe that Iveco and its customers will thrive in Malaysia together with Federal Auto and their strong team,“ concluded Lombardi. Federal Auto is today one of the most dynamic automotive dealers in Malaysia with strong business ethics, impeccable integrity and a solid reputation built over five decades. Its representation of world-class automotive brands has come about through its long experience and expertise in the business, as well as the resources and its drive to succeed. 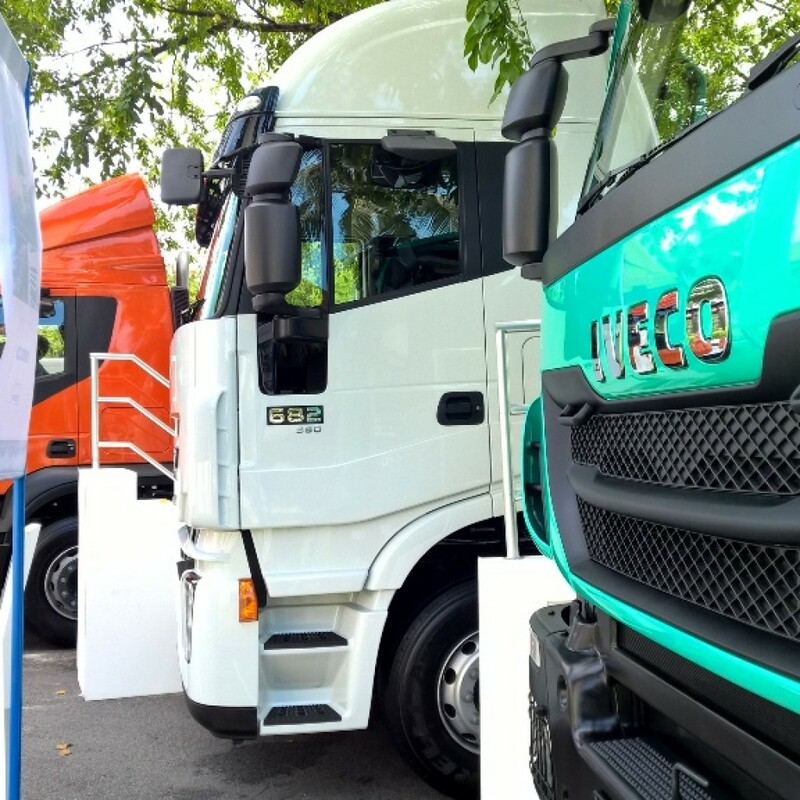 The Iveco Stralis heavy commercial vehicle is an excellent solution for the haulage industry due to its low fuel consumption, high reliability, superior safety features, best-in-class cabin ergonomics and comfort. 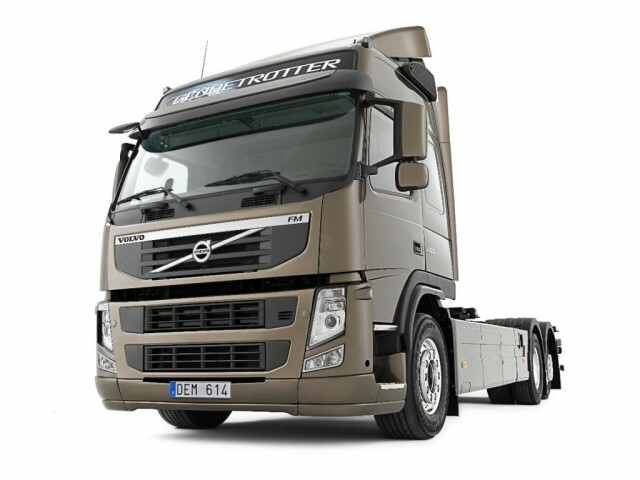 The on-road vehicle, with a gross combined weight (GCW) up to 44 tonnes, is presented in the following models: 4×2, tractor with rear air suspension, rough road version; 6×2 tractor with rear air suspension, twin wheels, third rear lift axle; 6×4 tractor with rear air suspension, for heavy mission. 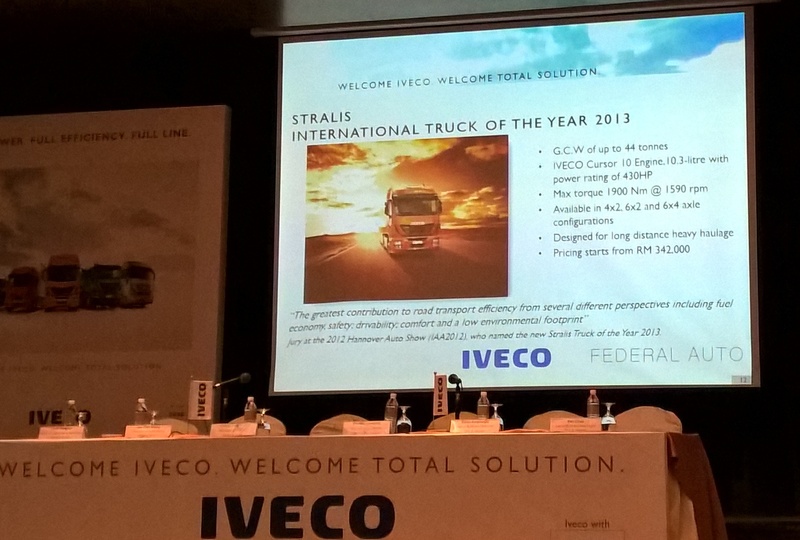 The Stralis is equipped with the Iveco cursor 10 engine, which is a 10.3-litre, 6-cylinder in-line engine, with a power rating of 430 hp. These outstanding features at the top of the category earned this model the Truck of the year 2013 at IAA show in Hannover, Germany. 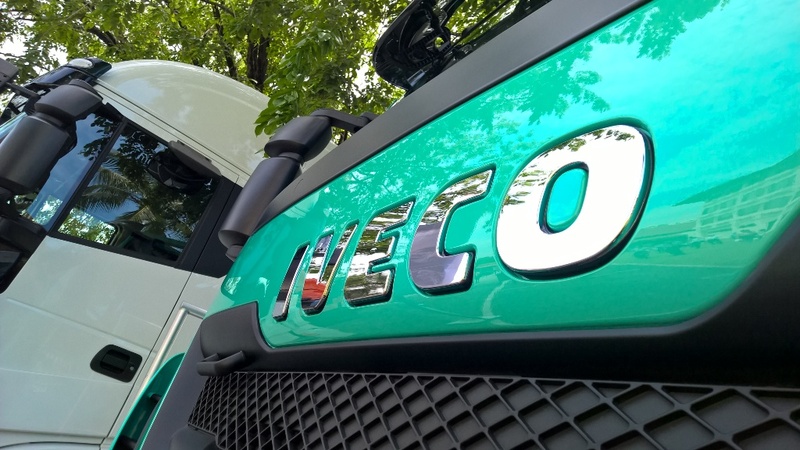 The Iveco 682 heavy-duty truck is the optimal combination of cost efficiency, strength and cutting-edge technology.It is currently offered in 4×2 (GCW 43 tonnes) and 6×4 (GCW 60 tonnes) variants for the tractor model, which is available in the on-road version. The truck is also presented in 6×4 (GVW 33 tonnes) and 8×4 (GVW 41 tonnes) variants for the tipper and mixer models, available in the off-road version. 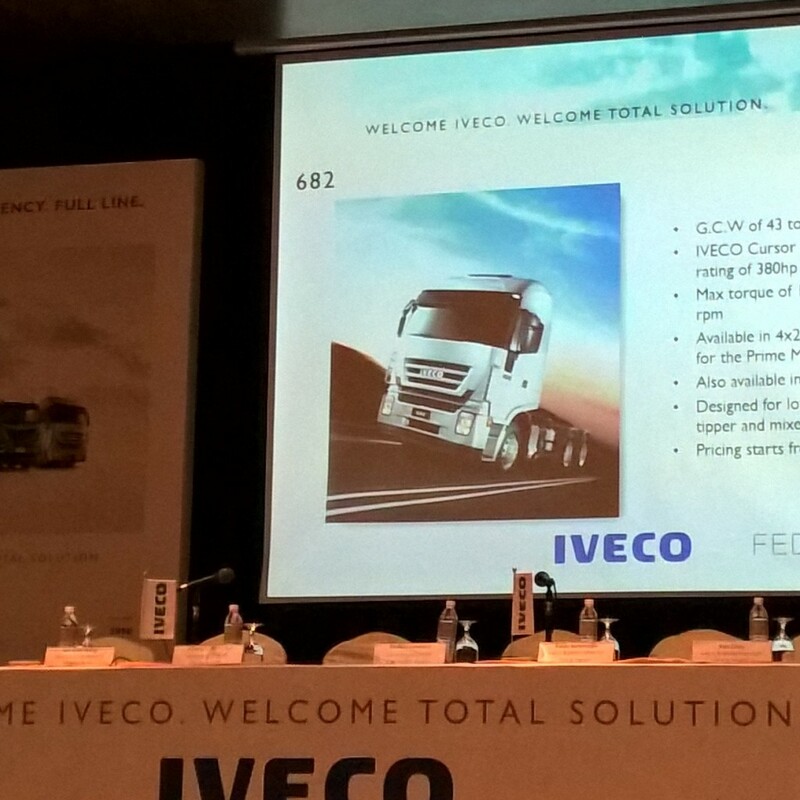 The 682 is powered either by Iveco cursor 9 or cursor 13 engines. The cursor 9 is an 8.7-litre, six-cylinder in-line engine available in three different power ratings: 290 hp, 340 hp and 380 hp, while the cursor 13 is a 12.8- litre, six-cylinder in line engine available in two power ratings: 430 hp and 480 hp. 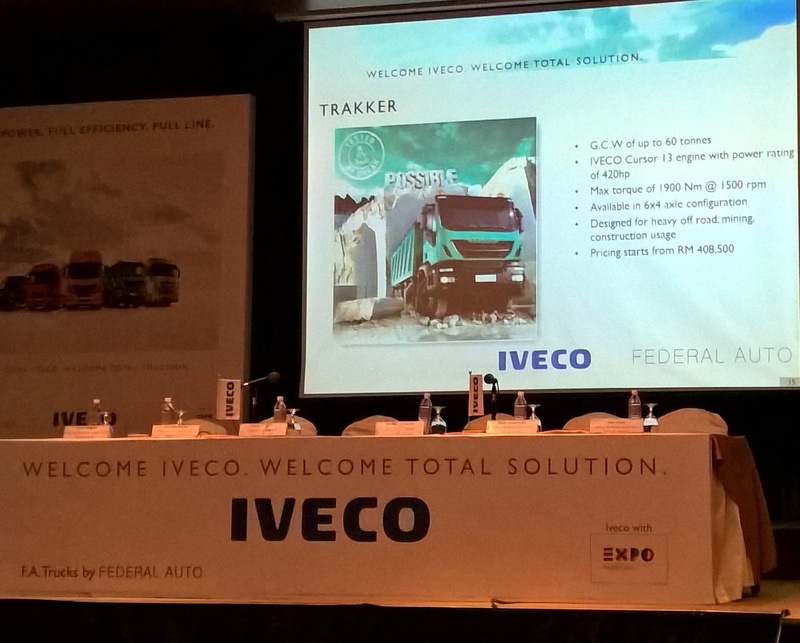 The Iveco Trakker is a high performance and robust truck designed to operate in the extreme off-road conditions often found in the construction and mining industries.The vehicle is presented in the 6×4 tractor model, with a GCW up to 60 tonnes. 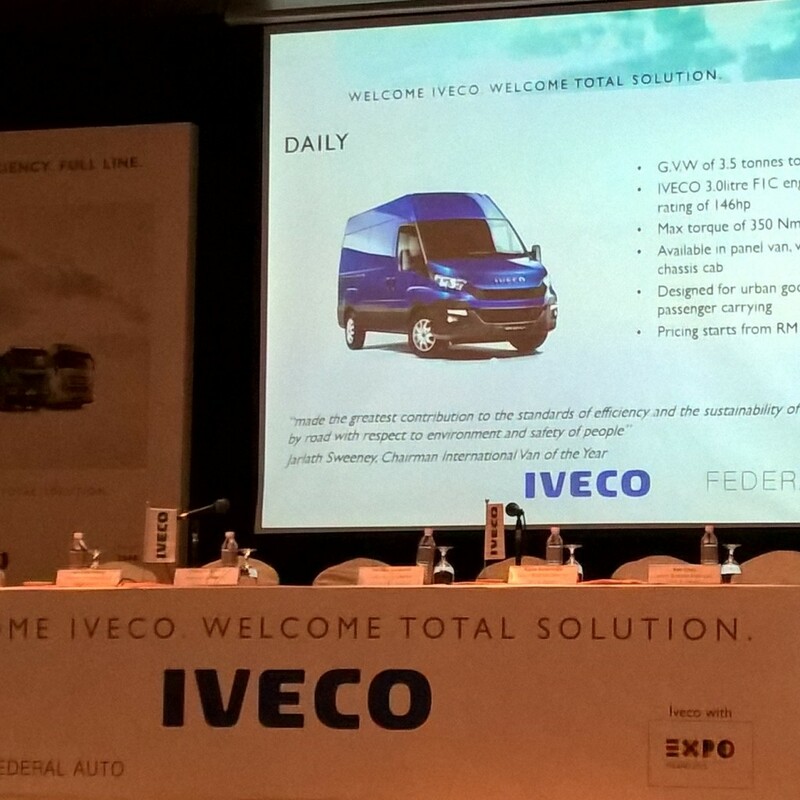 It is powered by the Iveco cursor 13, a 12.8-litre, six-cylinder in-line engine available with 420 hp. 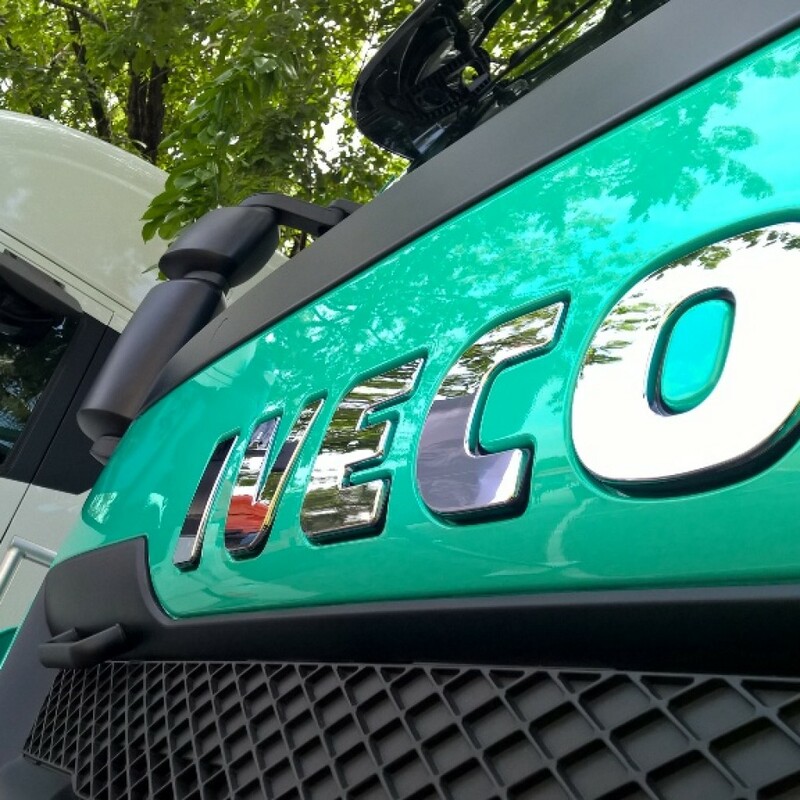 The Iveco Eurocargo medium truck offers unprecedented reliability, flexibility and versatility. It is available in multiple variations to suit different needs. 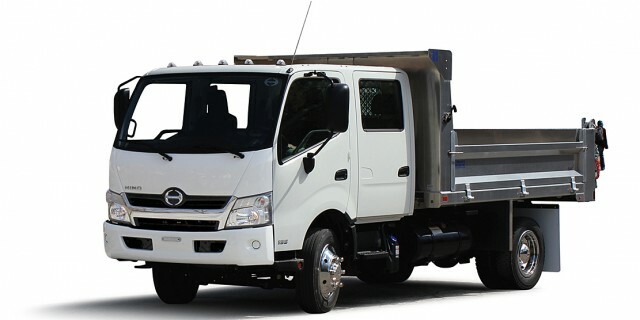 The on-road vehicle is currently presented in the 4×2 truck model, with mechanical suspension, with a GVW up to 18 tonnes. 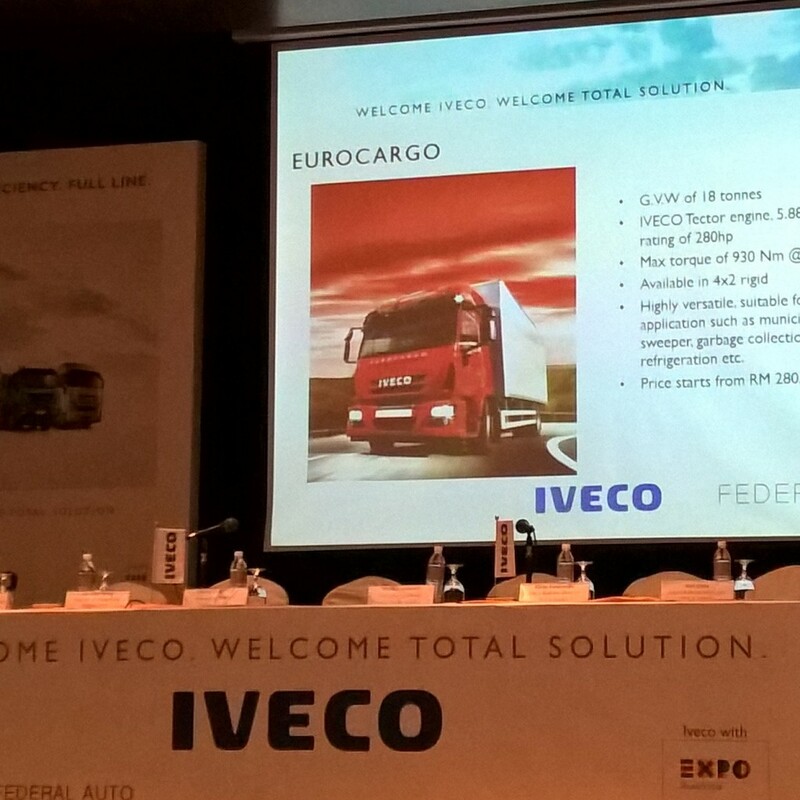 Eurocargo features a tector 6, a 5.9-litre, six-cylinder in-line engine available with 280 hp. 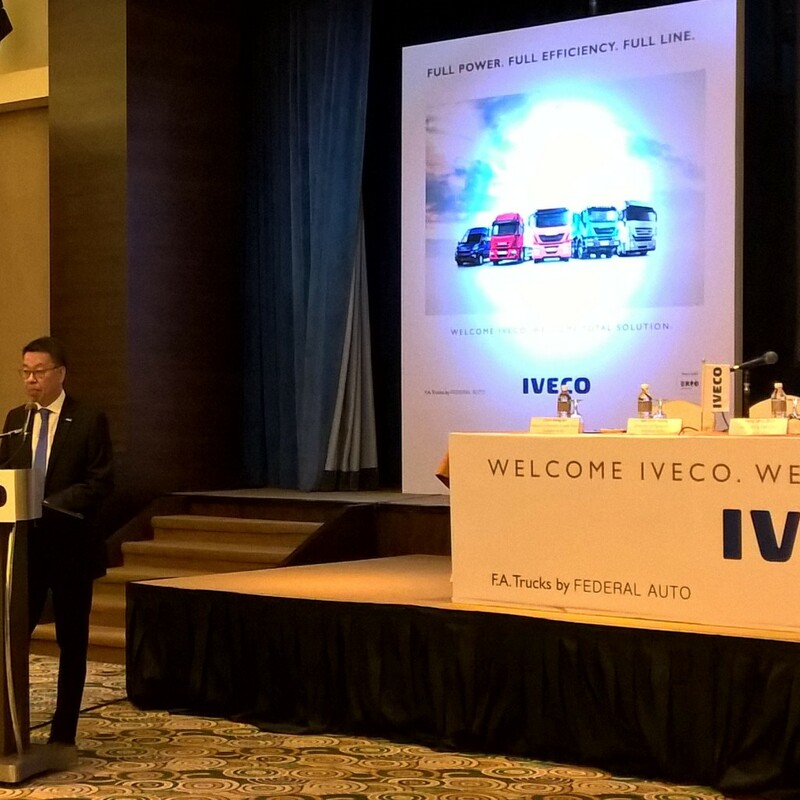 “With this ongoing success we are reinforcing our global lead in hybrid buses. Cities all over the world now regard electrified bus traffic as a cost-efficient way of reducing the problems of poor air quality and noise. Our solution makes travel more attractive and improves the environment without the need for large investments in new infrastructure.” says Håkan Agnevall, President and CEO Volvo Buses. 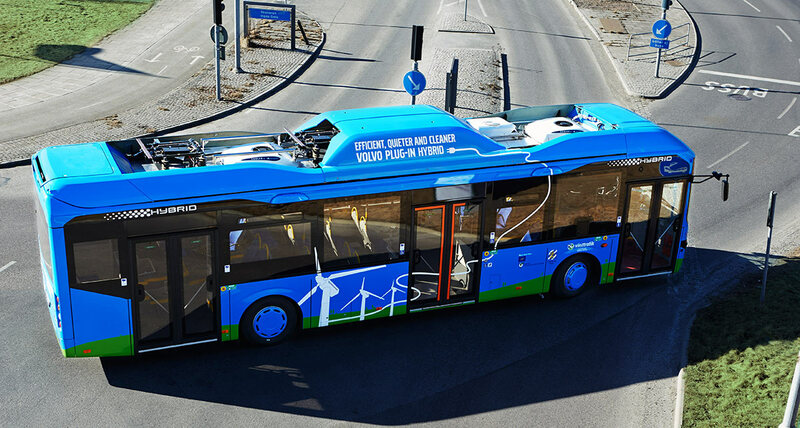 The Volvo Buses range of complete hybrid buses encompasses the two-axle Volvo 7900 Hybrid, Volvo 7900 Articulated Hybrid and Volvo 7900 Electric Hybrid. 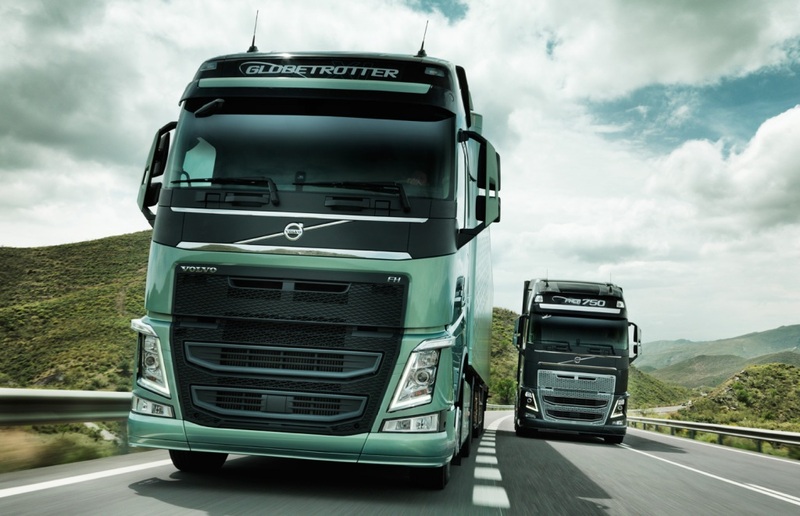 Chassis with Volvo hybrid drivelines also form the basis for British double deckers and high-capacity models in South America and other markets. 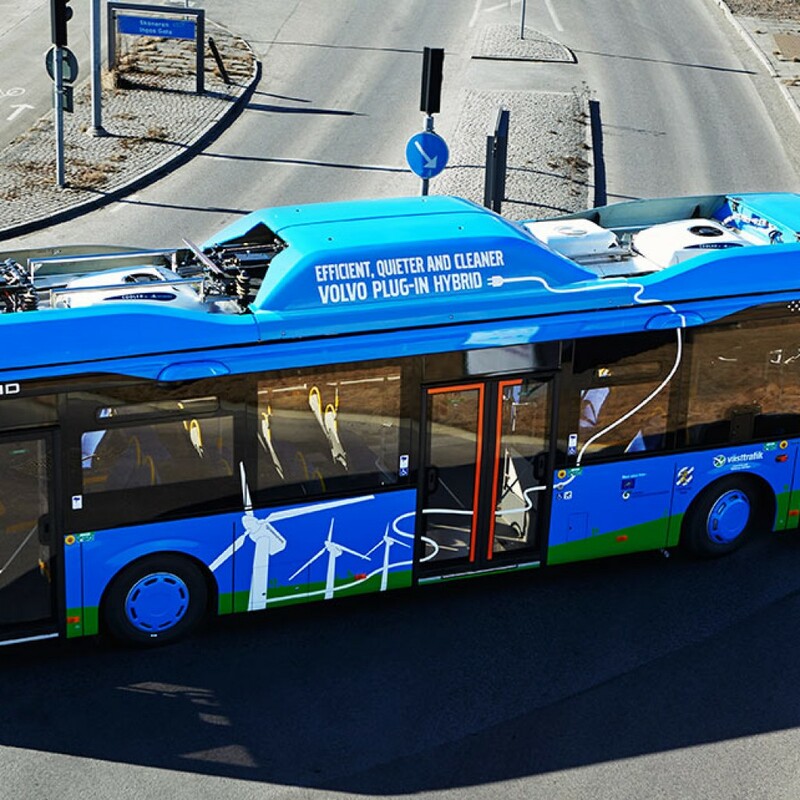 In addition, Volvo offers holistic solutions encompassing maintenance of the entire bus, including batteries, at a fixed predetermined cost. 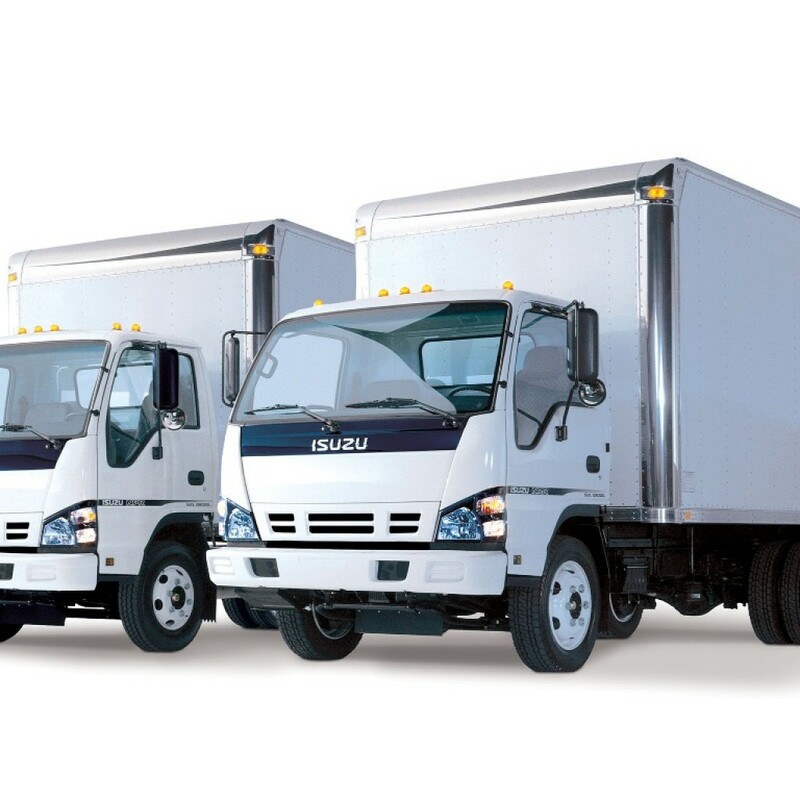 Hybrid Powered Trucks, Is It The Future? 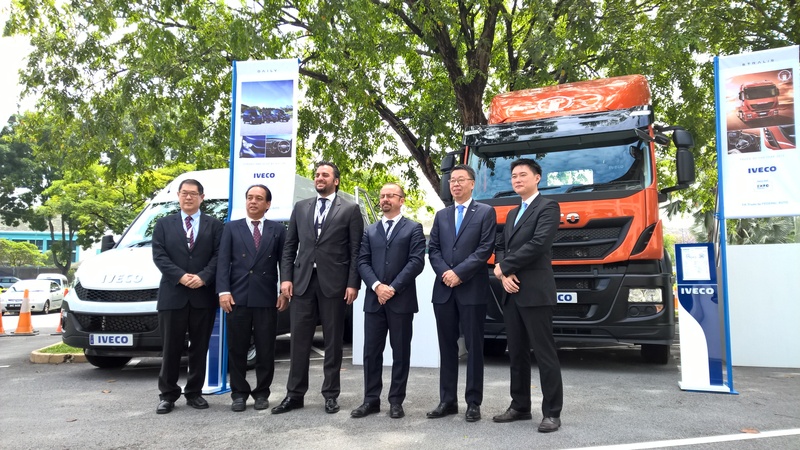 With the fall of fuel prices late last year and the current increase in the use of NGV to power commercial trucks, many people have wondered whether the hybrid truck still has a place in the future of transportation. With a hybrid truck there is still a tremendous environmental benefit. If you are getting 15 to 30% fuel savings, you are also getting a 15 to 30% environmental savings. 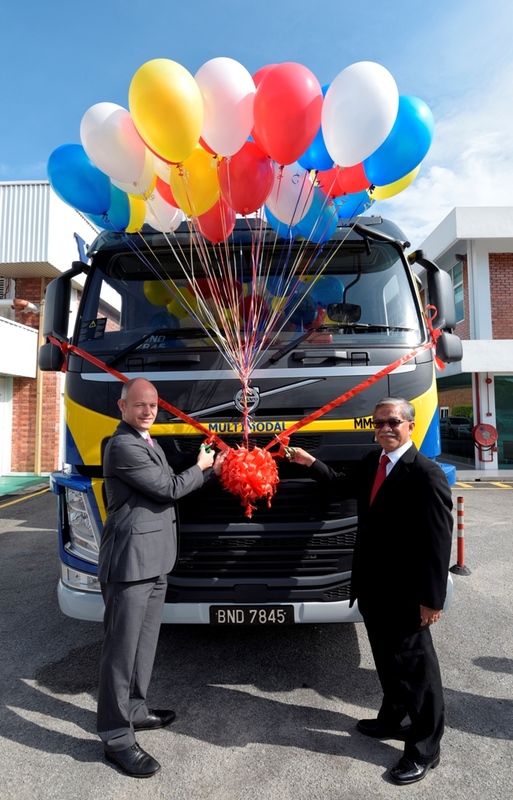 Volvo Trucks has continued its success from another good performance last year when it successfully delivered the balanced 14 units of the Volvo FM440 trucks to Multimodal Freight Sdn Bhd of the total 50 units purchased by Multimodal Freight Sdn Bhd, a wholly owned subsidiary of Keretapi Tanah Melayu Bhd. To signify and commemorate this occasion of full handing over of the 50 units of FM440, a simple ribbon cutting ceremony by YBhg. 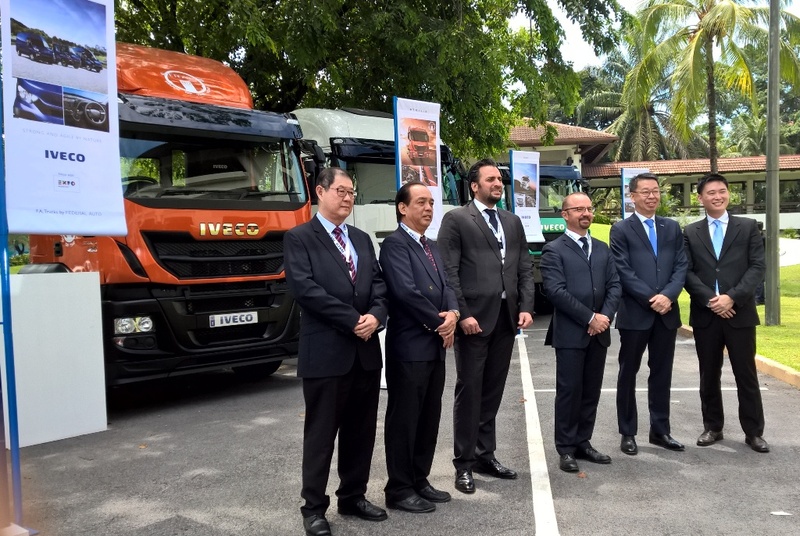 Dato’ Sr. Ahmad Zainuddin bin Jamaluddin on behalf of Multimodal Freight Sdn Bhd was held in the presence of both senior management of Multimodal Freight and Volvo Trucks. 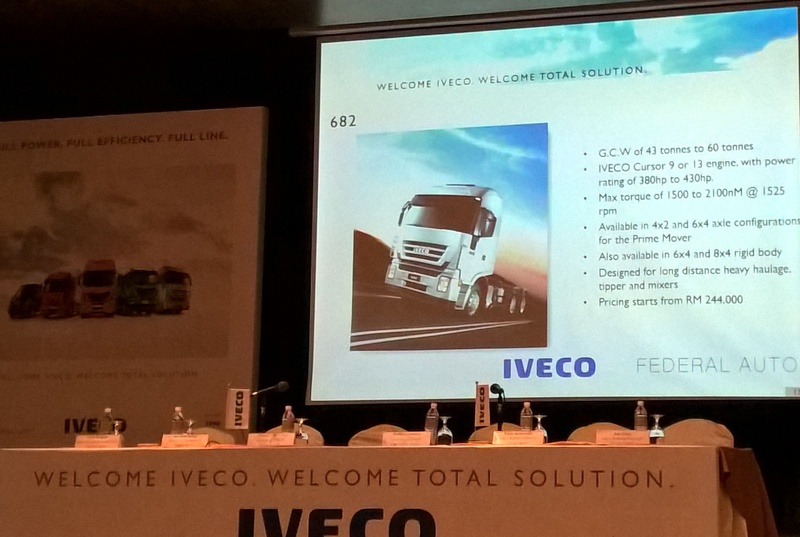 Concurrently at this event, Multimodal also signed up for Volvo’s Gold Service Agreement for all 50 units of trucks for 5 years. The Agreement covers Preventive Maintenance (basic service including labour, filter and lubricant) and fair wear and tear. 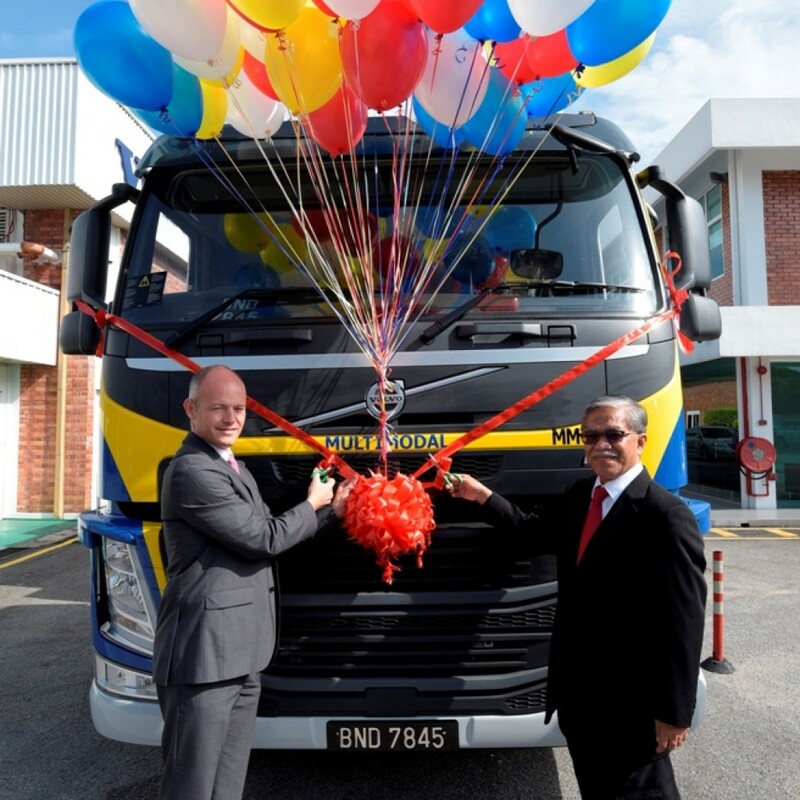 Mats Nilsson, Managing Director of Volvo Malaysia and En. 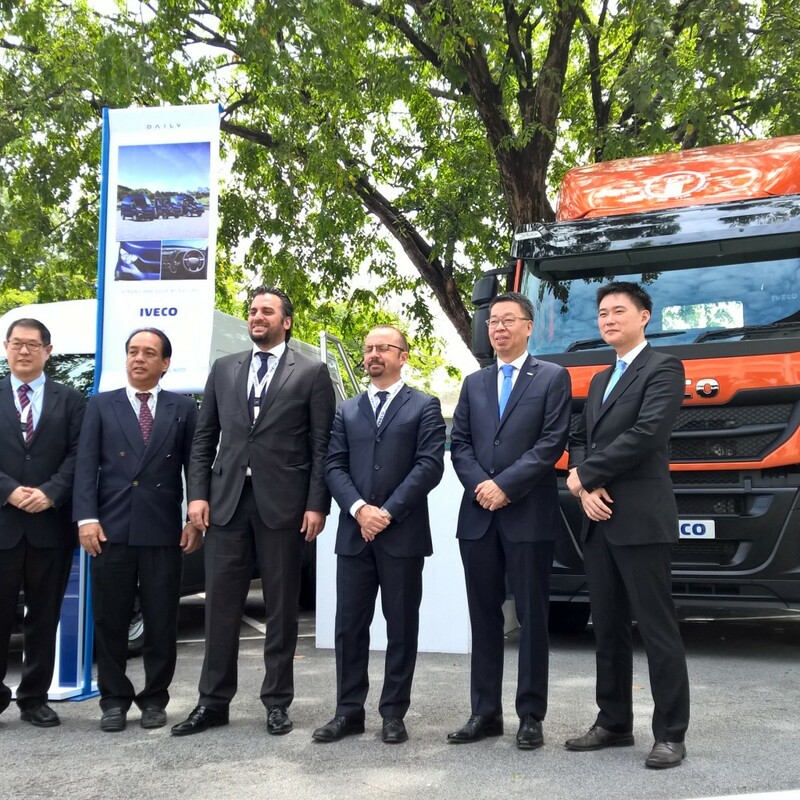 Mohd Hasdey Yaakob, Chief Executive Officer of Multimodal Freight Sdn Bhd was the signatories of the Volvo’s Gold Service Agreement. The new Mercedes-Benz CapaCity L is a further solution to the high density of traffic in cities. The longest complete Mercedes-Benz of all has a length of 21 metres and can carry up to 191 passengers. 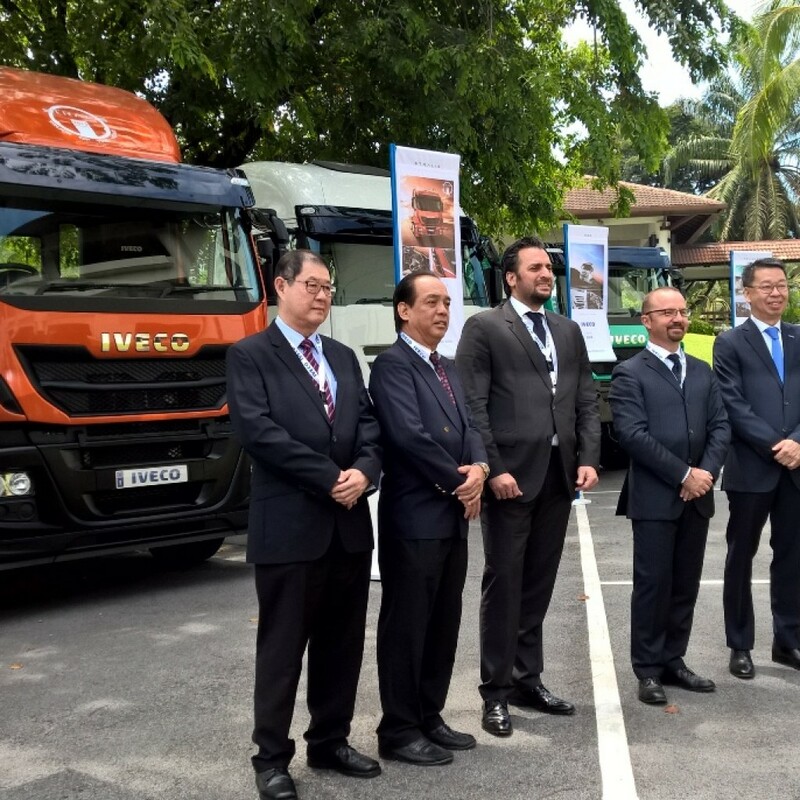 This XXL bus is therefore able to replace around 50 passenger cars on the roads, relieving urban traffic congestion. 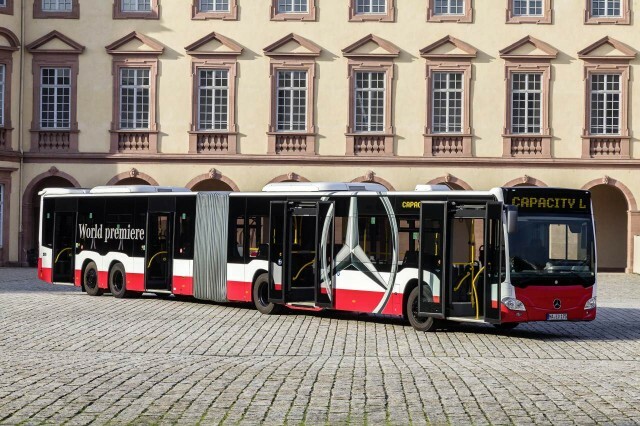 The new large-capacity bus is not only enormous in size, but also enormously cost-effective and environmentally friendly: when filled to capacity it consumes less than 0.5 litres of diesel fuel per 100 kilometres per passenger. Which probably makes it the world’s most economical diesel powered bus. The new CapaCity L has arrived at just the right time: passenger numbers using urban public transport are increasing worldwide. The UITP (Union internationale des Transports Public) estimates an increase of around ten percent in the EU since 2000, a trend which is continuing to rise. On average, every city-dweller in the EU makes use of public transport 132 times per year. The CapaCity L is the ideal bus for BRT systems. BRT stands for Bus Rapid Transit, i.e. fast bus transport systems. BRT systems use their own lanes and are much faster, less expensive and more flexibly usable than rail systems. Daimler has an in-house department supporting the introduction of BRT systems. Its experts are in action worldwide, and involved in transport systems in Rio de Janeiro, Johannesburg, Strasbourg and Istanbul, for example. At present their focus in on Japan, where they wish to resolve the transport problems accompanying the 2020 Olympic Games in Tokyo. The Mercedes-Benz Citaro is the world’s best-selling city bus: almost 45,000 Citaro models are on the roads in Europe’s major cities and beyond. At present the Citaro is powered by a clean and highly economical diesel engine meeting the stringent Euro VI emissions standard. This is now being joined by another: the UITP Congress will see the world premiere of a new natural gas engine for the city bus. It is significantly quieter than the already quiet diesel engines. 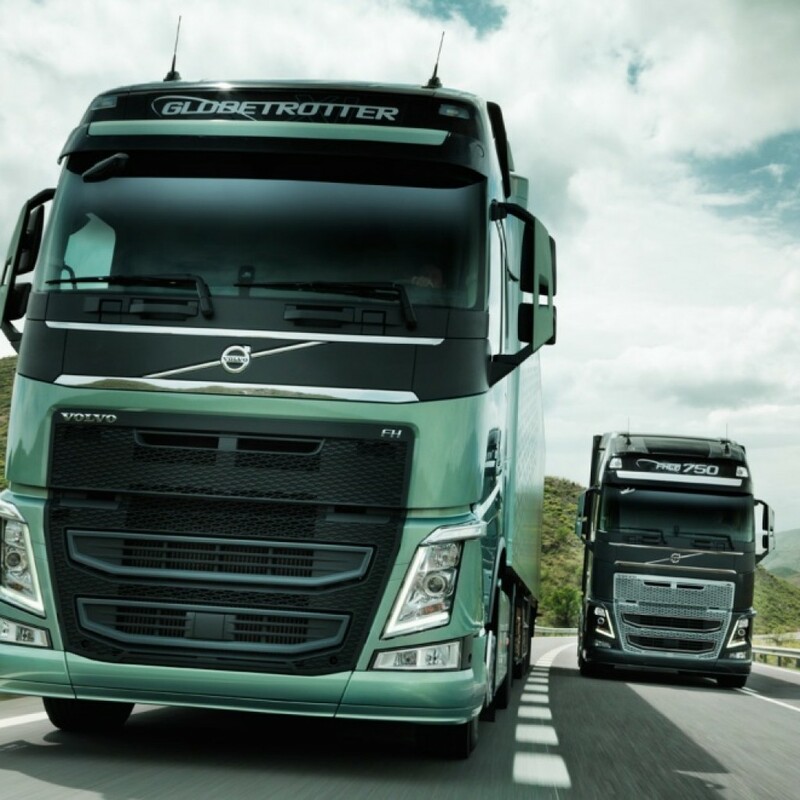 Moreover, its CO2 emissions are more than 20 percent lower compared with the diesel equivalent. Daimler is also looking into the near future: before the end of the decade, the Citaro E-CELL with battery-electric drive and the Citaro F-CELL with fuel cell drive will enter series production. 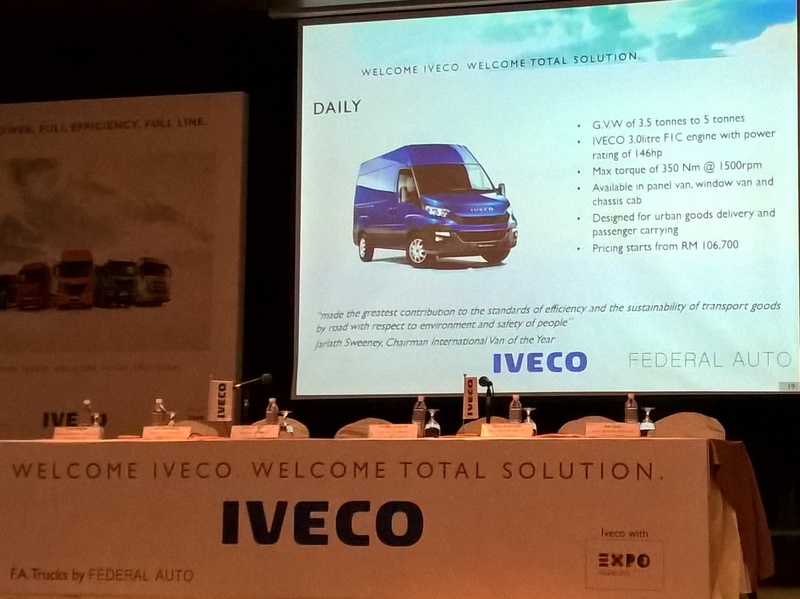 The forecast: in 2030, 70 percent of all newly acquired Citaros will be locally emission-free with electric drive. 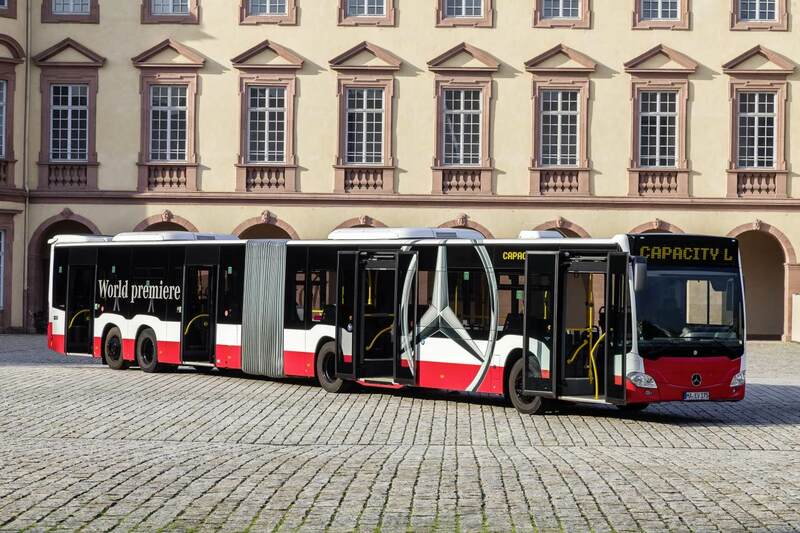 The Citaro E-CELL and F-CELL will be based on a modular e-platform. 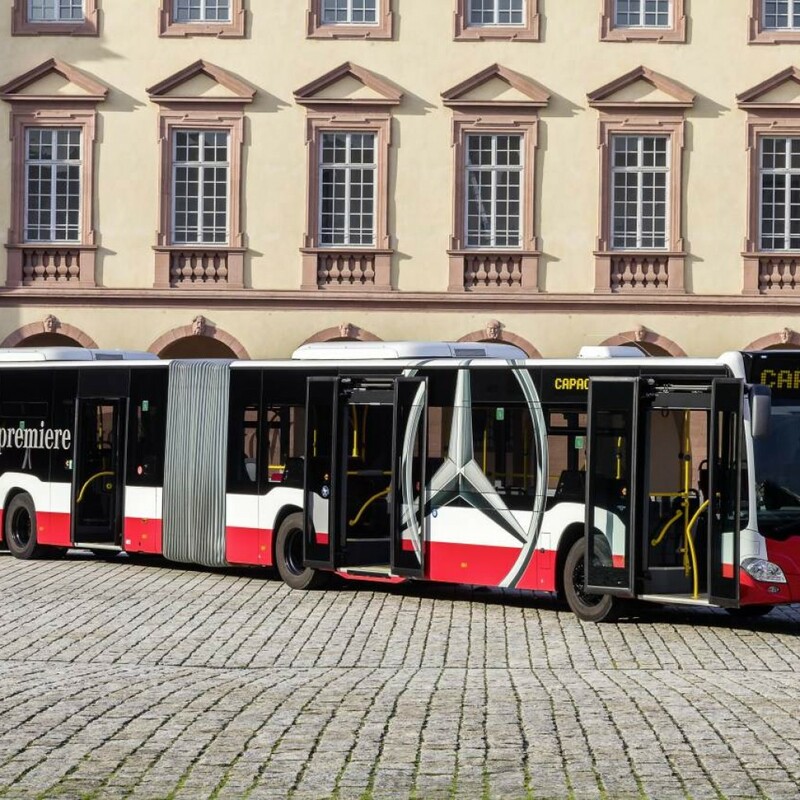 This allows tailor-made electric mobility for individual cities and even for each bus route: the battery capacity and charging technology are suited to the individual requirements. At the same time Daimler is concertedly driving the further development of the diesel engine: new fuel-saving technologies such as a compact hybrid are set to achieve a further reduction in fuel consumption and therefore CO2 emissions by around ten percent. With the moovel platform Daimler is changing into a mobility provider. moovel is an app which compares all the available means of transport with each other in terms of travel time and cost after the destination is entered: public transport, car and bike sharing, taxi or lift sharing. Both for inhabitants and visitors to a city or region: moovel knows the best way from A to B. And moovel can do even more: using the flexible car2go mobility scheme, customers can rent a smart car spontaneously at any time and at the end of their journey park it anywhere within the relevant designated area. Customers locate the vehicles using their smartphone or computer and only pay for the hire time which is calculated by the minute. Volvo Trucks Sweden has just announced the appointment of former Scania Trucks president and chief executive officer Martin Lundstedt (pictured) as its own new president and CEO. Lundstedt, who will take up his new job in October, replaces Olof Persson who steps down with immediate effect. Group chief financial officer Jan Gurander will take over Persson’s responsibilities in the interim. 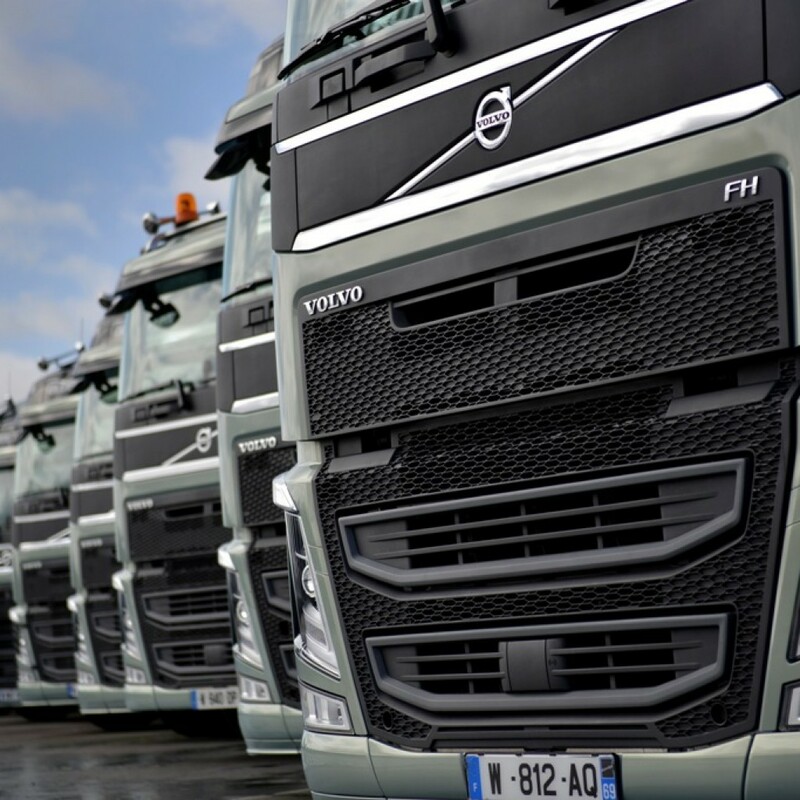 A spokesman for Volvo confirmed that Persson, who had been at the helm for almost four years, did not leave of his own volition. 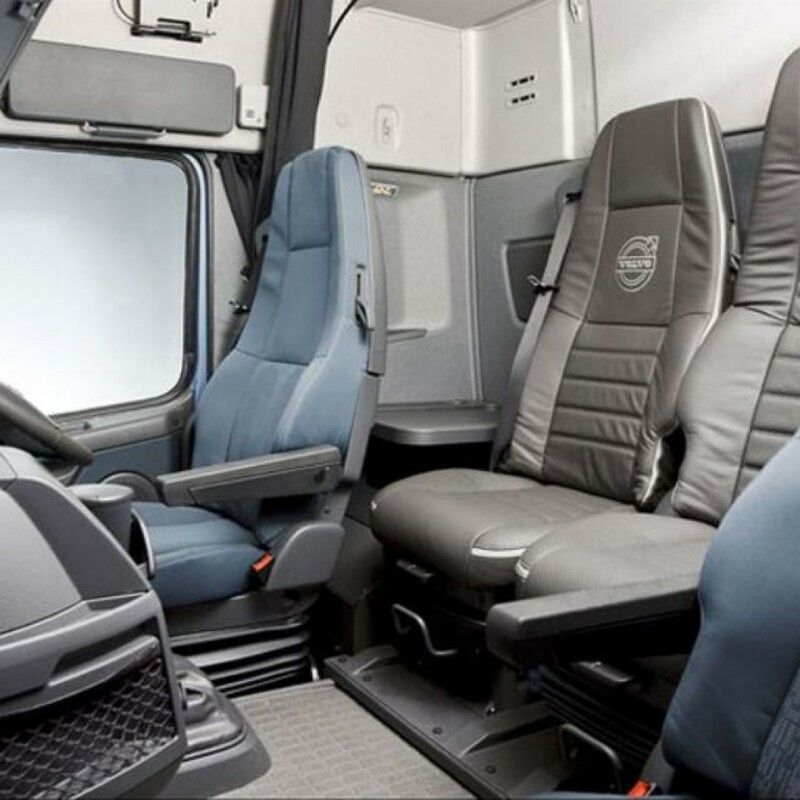 “It was an initiative taken by the AB Volvo board,” he said. 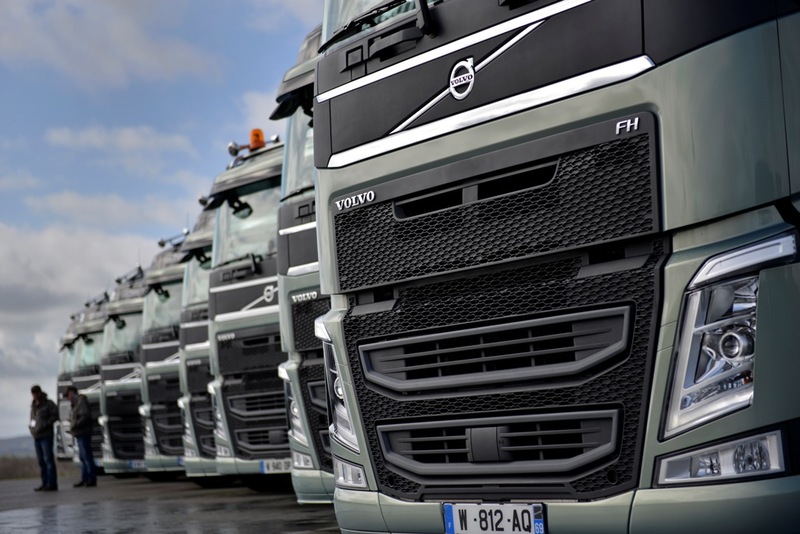 He also did not deny suggestions that Persson’s departure was triggered by the company’s poor profitability in recent years, a point also addressed by AB Volvo board chairman Carl-Henric Svanberg. When Persson took on the position as CEO, Volvo faced two problems, said Svanberg high costs and fluctuating earnings. “I have great respect for what Olof has achieved. However you cannot get to a leading position only by cutting costs – it can only be achieved by meeting the customers and therefore we are entering a new phase, a phase where we will increase our focus on our brands, customers and products,” he said. 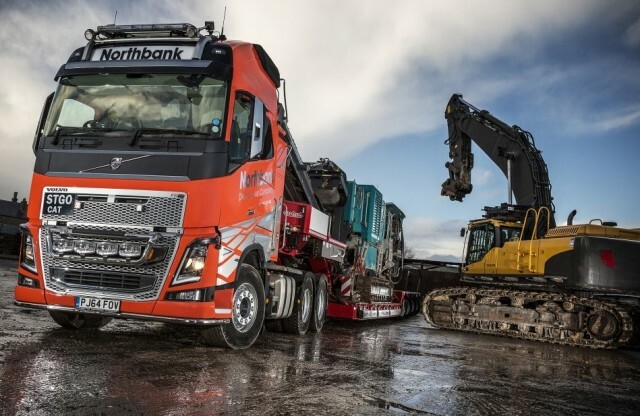 “After three years of focus on product renewal, internal efficiency and restructuring, the Volvo Group is gradually entering a new phase with an increased focus on growth and increased profitability,” added Svanberg. Lundstedt’s history with Scania dates back to 1992, during which time he has held numerous executive positions including roles in production, development, marketing and sales. With the launch of the D155AXi-8, Komatsu has once again expanded its lineup of “intelligent” earthmoving equipment. 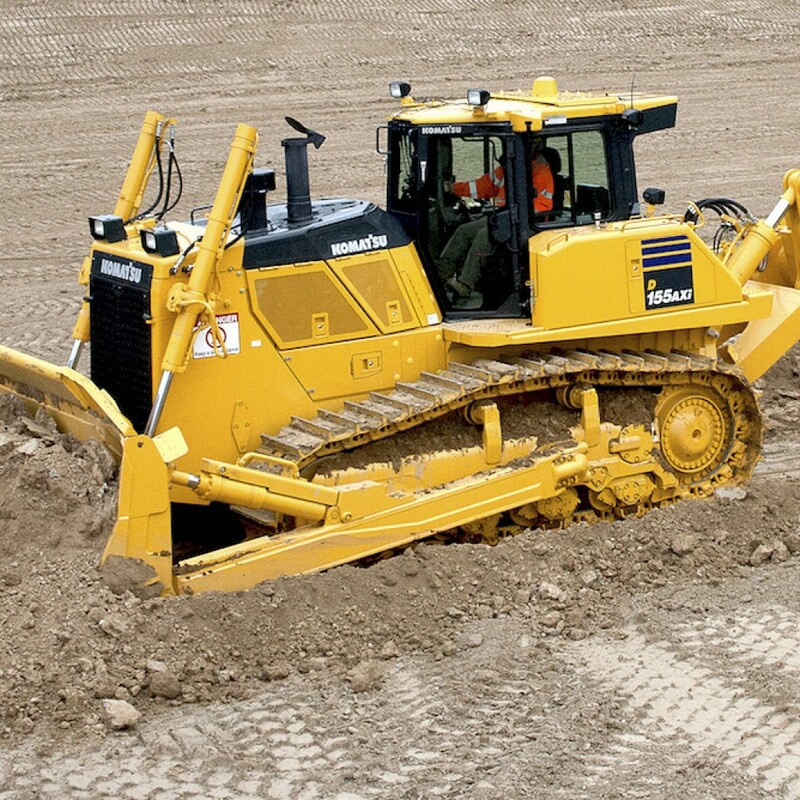 The D155AXi-8 is the largest iMC crawler dozer Komatsu has released and its first in the 261-500 horsepower size class. As such, the machine is designed to handle a range of highway construction, large residential or commercial site prep projects. This bulldozer is powered by a 354-horsepower Komatsu SAA6D140E-7 Tier 4 Final 15.24-liter diesel engine that enables the machine to emit 80 percent less NOx than the Tier 4 unit the D155AXi-8 replaces. Thanks to iMC’s Inertial Measuring Unit and stroke-sensing hydraulic cylinders, the machine has the ability to sense and control blade load. 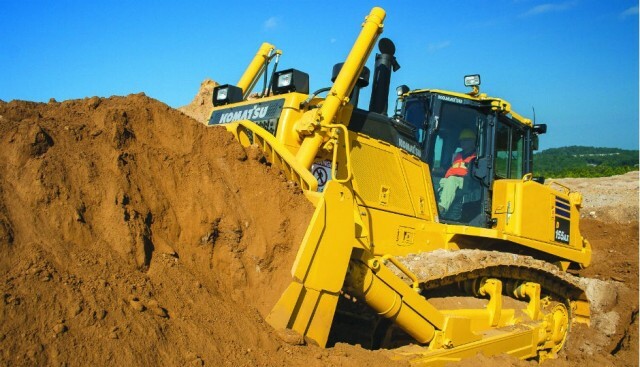 Komatsu says the technology delivers an 8-percent efficiency boost in moving material compared to third-party aftermarket machine control systems during a grading test. And unlike aftermarket solutions, there are no components mounted to the machine blade, only a small GNSS antenna atop the cab, eliminating the need to climb on the blade to install or remove GNSS antennas, or deal with snagged cables. For maximum efficiency, Komatsu has included an automatic gearshift transmission and lock up torque converter that enables the operator to select the best gear range depending upon both the jobsite conditions and the load. By transferring engine power directly to the transmission, horsepower loss is eliminated, and fuel consumption is reduced by up to 10 percent. 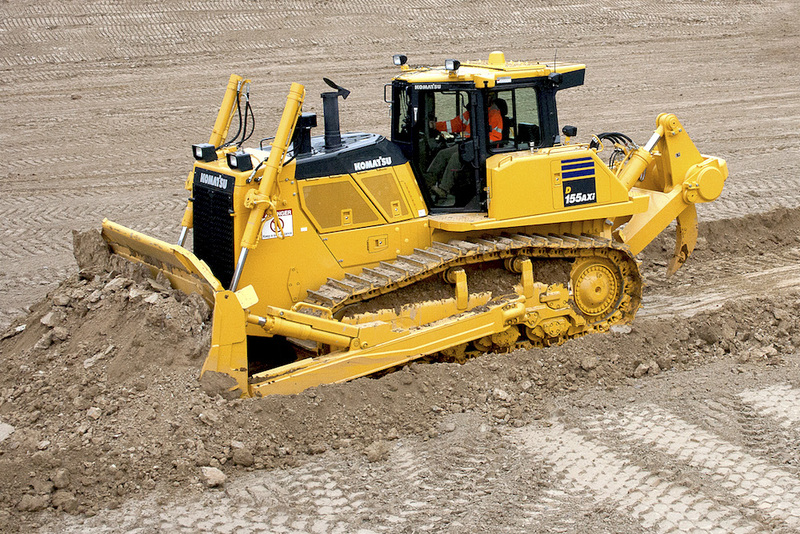 The addition of Komatsu’s Sigmadozer blade, which is designed to roll up soil at the center of the blade, ensures reduced digging resistance. The blade dozes up to 15 percent more soil compared to semi-u blades, while using less power, according to the company. To enhance operator comfort, Komatsu had included a ROPS pressurized cab with damper mounts that isolate the cab from the machine frame, which softens the shocks and vibrations. 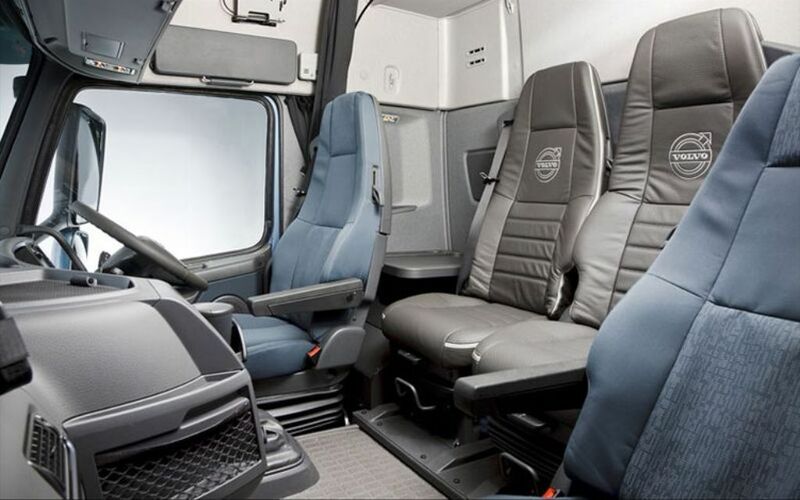 The cab also has large windows to provide visibility and is sealed to reduce dust and noise inside the cab. Magna International has been selected as a 2015 Automotive News PACE Award winner for its PureView seamless sliding window, which was created with pickup trucks and commercial vehicles in mind. 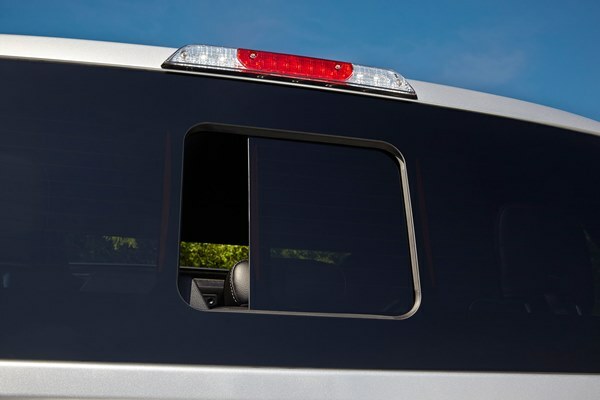 PureView eliminates the vertical seams that mark the edges of conventional truck sliding rear windows, creating a smooth opening when viewed from outside. The first-to-market design made its debut on the 2015 Ford F-150 and sets a new trend for power sliders by reducing component needs and improving overall functionality and manufacturing efficiency. Standard sliding rear windows typically contain three pieces of glass – left and right panes that don’t move, plus the sliding portion in the middle, all held together by a support structure that requires numerous components. The PureView seamless sliding window uses only two pieces of glass – the exterior surround and the sliding portion, which reduces build componentry and complexity. In addition to its streamlined looks, the window’s two-piece design enables continuous uninterrupted defrost capability for the larger surrounding glass. The new design also contributes to vehicle weight savings, as the seamless power slider uses a lighter window control module.